In his Metaphysics of Morals (1797), Immanuel Kant offered an explanation of why a theory of justice cannot allow me to sign a contract selling myself into slavery. The explanation goes something like this. A contract must be able to bind the parties to it. In order to be binding, a contract must apply to an agent who is capable of being bound, for example a legal person (specifically for Kant, a rational agent). But when I sign a slavery contract, I am in effect signing away my status as a legal person, making myself instead the mere tool of another’s will. As soon as I am no longer a legal person, I can no longer be bound by a contract, any more than a baby or a rock or a goldfish can be bound by one. Therefore, paradoxically, as soon as I sign the contract making myself a slave, by that very act I make myself not bound by the contract which I have signed. To put it another way, the act by which I sell myself into slavery simultaneously releases me from slavery. As such, the contract is irrational. Furthermore, because of the irrational nature of the contract, it cannot be construed as the expression of the will of a rational being. As such, it cannot be binding on a rational agent. 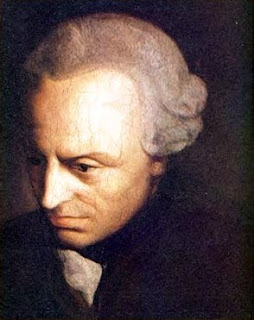 Kant’s explanation is based on the idea that moral agents — such agents being the only ones capable of being bound by contracts — have this status by virtue of being autonomous, able to adopt their own ends and employ the means at their disposal to achieve those ends. “Autonomy” implies the ability to give laws to oneself (from the Greek auto, “self” and nomos, “law”). And autonomy for Kant is in turn based in rationality, because while many creatures obey instincts and inclinations, only rational creatures are capable of autonomy, of giving and consciously obeying laws. When I form a contract, it is as if I am binding myself to obey a law of my own choosing, which presupposes that I am rational and autonomous. But, as soon as I bind myself to a law that absolves me of this “law-abiding” nature, I dissolve the contract, because now there is only one party to the contract, namely the prospective slave-master. It is no longer a valid contract. This is a very clever argument, no? And yet, there is something slippery, something (for lack of a better word) lawyerly and creepy about it. In a formal sense, it may be valid, and might satisfy a judge — assuming one’s legal jurisdiction didn’t already prohibit such contracts ab initio. The problem is that it doesn’t really coordinate with why we laypeople think that slavery is morally wrong. The fact is, slavery contracts are unenforceable not primarily because of their lack of formal coherence, but because slavery is wrong. The US Civil War was not fought over the formal irrationality or the self-defeating nature of slave purchases, but because many in the United States found the practice repugnant and in violation of their sense of decency and justice. Slavery is unjust, and it would be unjust even if the slave were happy being a slave. This becomes obvious when we turn from slavery contracts to forced slavery, which is the more common form in which we find the institution. Forced slavery is wrong, and I submit that most of us believe it would be wrong even when the master treats his slaves with all the kindness he would treat any other person. It is simply wrong to treat another person as if she were less than a person, as a thing, without a will, or desires, or projects of her own. In his difficult and convoluted way I think Kant would agree with this assessment, and certainly something like it is implied in the rest of his moral theory, and in his notion of the Categorical Imperative (which I don’t have space to explicate here). I believe there are at least two things lacking in Kant’s explanation. First of all, it focuses on the prospective slave’s end of the bargain. He claims that it is incoherent for him to try to become a slave. But what we’re looking for here is not incoherence, but rather wrongness. And wrongness lies on both sides of the bargain. It is wrong for the master to wish to make another completely subject to his will; in Kantian terms, it treats the other as a mere means to his ends rather than as an end in himself. Similarly, it is wrong for the slave to try to annihilate his own person in this way, for he owes the same respect to himself as a person that others owe to him. Secondly, he’s trying to get away with a formal explanation of why slavery is wrong, without touching on the substantive issue. Formally speaking, the contract is “wrong” on rational grounds, because it is incoherent. But this doesn’t really touch on wrongness as such, otherwise it would be just as morally wrong of me to make errors in arithmetic or to violate the Law of Excluded Middle. The real wrongness of slavery, whether contractual or otherwise, is in its treatment of people as if they were mere things, rather than as persons with an inherent dignity and moral worth. Slavery is not a problem of contract law, nor is it a problem of logic. That would be too detached, too philosophical a way of viewing it. Rather, slavery is a moral wrong, pure and simple, and not only because of lack of consent on the part of the slave, for it is wrong even with consent. It is wrong for the slave to consent to it, and it is wrong for the master to accept such consent from others. There is much in Kant’s moral theory that would allow him to argue as much, which is why it is disappointing to see so great a philosopher offering instead an argument more worthy of a mere lawyer. While I certainly don't disagree with you here, I do feel that your idea of "wrong" needs a little more explication than what you've given. Admittedly a slaver is unlikely to be convinced by any argument short of a gun, but that misses the point, which is to convince those who aren't necessarily involved in slavery that it's in their interest to move against those who are. I felt that your defense of theft (in cases of need) in your property article below, suffered somewhat in a similar way. Likewise when you enslave, you become a slaver which is a lesser class of human being. In addition, of course, anybody is potential fair game for your enslaving ways, not just those you have, for your own convenience, dubbed as less-than-human and thus open for enslavement. Actions aren't neutral or discrete, they bind the acting subject and the acted upon object in a relationship that extends beyond just the action in question. Oh, I definitely agree with you. My idea of "wrong" does need considerable explication. Unfortunately, that would take a post or two in itself (assuming it's possible). My only point here was to say that, whatever is wrong about slavery has little if anything to do with logical contradiction, nor is it a problem of contract law. It is a MORAL WRONG, and its wrongness is MORAL wrongness, however defined. And because of that wrongness, in the case of a slavery contract, a wrong is commmitted by BOTH sides of the deal (would this apply to prostitution as well?). I suppose if you were reading a positive doctrine into my message, it might be some sort of an intuitionist one: most people just "know" or "feel" it is wrong, end of story, and if you don't know or feel this, there's something wrong with YOU, not the rest of us. Philosophically unsatisfactory, I know. But sometimes philosophising, especially MORAL philosophising, can only take us down so far, before we hit rock bottom. Unfortunately, Kant wants more than this, and his search for explanation takes him much too far away from that which he seeks to explain -- a common disease of philosophy. I am very sympathetic to your approach, which sounds very much like a virtue-ethical approach. It's not just slavery that's wrong, but there must be something wrong with the people who engage in it. But still we're left with this lack of explication of what constitutes the "wrongness" here, and I'm afraid I don't quite have a solution that doesn't rely on the standards of the "right-thinking/feeling" person, which is itself begging the question. To paraphrase Wittgenstein, after a certain point in philosophising, it seems like all we can do is emit a grunt. I'll only add that for I believe that for Kant, wrong and rationally incoherent are one and the same. Kant identifies moral decision making with pure rational reasoning. For a rational agent, there is no other choice but to act morally. Correct, Shay. Kant did identify moral decision making with pure rational reasoning. However, he never convinced me. For instance, there is Bernard Williams’ example of the husband who does all the right things for his wife because he “reasons” that it’s his duty to do so. Is that really what his wife wants to hear? Another example: it’s perfectly conceivable that someone might "reason" perfectly about right and wrong, coming to the correct conclusions, while not being in the least motivated to act upon it, or perceiving oneself as obligated so to act. Something akin to psychopathy. It would be like (to paraphrase a well-known line about psychopaths) understanding the words while not hearing the music. Also, when Kant writes about "reverence for the moral law", I can't help but think he's trying to have his cake and eat it too -- smuggling in a feeling (reverence/piety/fear) to bridge the gap between reason and motivation. There are other such passages scattered around Kant’s work that make me question his commitment to morality as pure reason. He needs to expand his notion of reason. I was trying to get at something like that in the above post. 1) Have you ever stumbled upon anything like Kant against the institution of slavery (which he knew existed all over the globe and contemporarily in the new American republic) ? Or Spinoza ? Or Locke ? 2) So Kant refuted (say) the rationality of selling oneself. What then about the doctor healing himself? He has contrary interests as a doctor and as a person (to employ Aristotle's example) so he cannot heal himself? 3) What would he say about the autonomy of myself re my body ? 4) He was not at all against using the other as a means , only against using the other as a means only.now in selling myself into slavery i am doing this for myself as an end since i do it in order to survive. 5)but this is the case for every instant of forceful slavery too, since there was always the option of fighting and being killed but the guy preferred slavery so he sold himself in order to stay alive. Was he being irrational and so a-moral ?